Warner Bros. 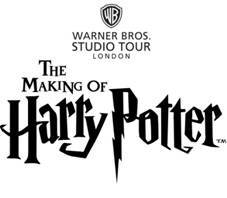 Studio Tour London – The Making of Harry Potter opened its doors on 31stMarch 2012. The unique attraction offers visitors the ultimate chance to get up close to authentic sets, discover the magic behind spellbinding special effects and explore the behind-the-scenes secrets of the Harry Potter film series. It’s been 15 years since Harry Potter and the Philosopher’s Stone made its cinema debut and, in celebration of this anniversary, Warner Bros. Studio Tour London – The Making of Harry Potter is running a series of special features, offering visitors the opportunity to go behind the scenes and discover where the filmmaking magic began. 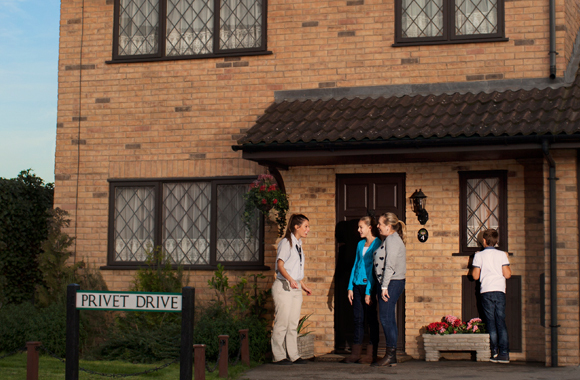 Fans will remember number four, Privet Drive as the Muggle home where Harry spent most of his childhood with his Aunt Petunia, Uncle Vernon and Cousin Dudley and now, for the first time ever, visitors will get the chance to step through the door and have a look into the Dursleys’ living room as the exterior set is opened especially for the Studio Tour’s 15th anniversary celebrations of the film, Harry Potter and the Philosopher’s Stone. During production, set decorators were tasked with filling the house with quirky pieces of furniture and had lots of fun sourcing the ugliest sofas, worst tiles and most unattractive curtains possible which will be on display in the fully dressed set. And for one week only, visitors will have the opportunity to walk through the front door and look into the Dursleys’ front room where hundreds of Harry’s Hogwarts letters created by MinaLima, the graphic designers for all eight Harry Potter films, will be suspended in the air as though they’ve flown through the fireplace as they did in the iconic scene from Harry Potter and the Philosopher’s Stone. The letter that started Harry’s adventure at Hogwarts School of Witchcraft and Wizardry featured so prominently in the film that an astonishing 10,000 of these envelopes were created for the first Harry Potter film and were even printed on extra lightweight paper so the owls could carry them. There is also the chance to see the Dursleys’ costumes. These were said to be a rich source of inspiration for Costume Designer Judianna Makovsky. She remembers them being the most fun to dress, creating clothes that appeared out of date and pretentious for Mr and Mrs Dursley, as well as hideous jumpers for young Dudley. In addition to all this, Warner. Bros Studio Tour London will be showcasing the equipment that was used to shoot Harry’s Hogwarts letters through the letterbox of number four, Privet Drive. The machine, which was specially created for the film by award winning Special Effects Supervisor John Richardson, will be on display in the Studio Tour during the feature between 27th May – 6th June. The Studio Tour has been well received with 97% of the 20,000+ reviews on TripAdvisor rating it as ‘Excellent’ or ‘Very Good’. A Storytelling Tour of Britain.